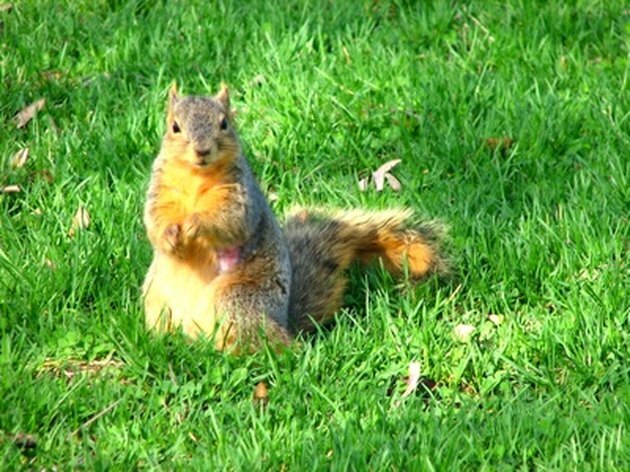 Squirrels are one of nature's most resourceful and cutest critters. Sometimes they can also be one of its greatest pests. Squirrels are inevitably drawn to birdfeeders and frequently find a way to empty them of their seeds. Squirrels also have a tendency to get into vegetable and flower gardens, devouring any morsels they can get their little paws on. Fortunately, you don't have to resort to violence to rid yourself of these hungry rodents. A natural repellent may prove just as effective. Too many squirrels can drive you absolutely nuts. Place 1 cup of crushed chili peppers into a large plastic container and add 1 gallon of water. Strain the mixture through cheesecloth to filter out larger chunks of pepper. Then pour the mixture into a plastic spray bottle. Spray the pepper solution anywhere you're having squirrel problems. For example, if squirrels are invading your garden, spray the pepper water onto the plants and around the perimeter of the garden. If squirrels have infiltrated your attic, simply spray any entry points and even the floor or rafters. Sprinkle dried and crushed cayenne peppers around trees or gardens for an added layer of defense.